A non-flying prototype of the car. Apparently inspired by the "Back to the Future" movie series, universities in Turkey and Japan have joined forces to build a flying electric car. Scientists from Gelişim University in Turkey and Nagasaki University in Japan are preparing to unveil a prototype of the car in the coming months, Turkish media outlets reported. 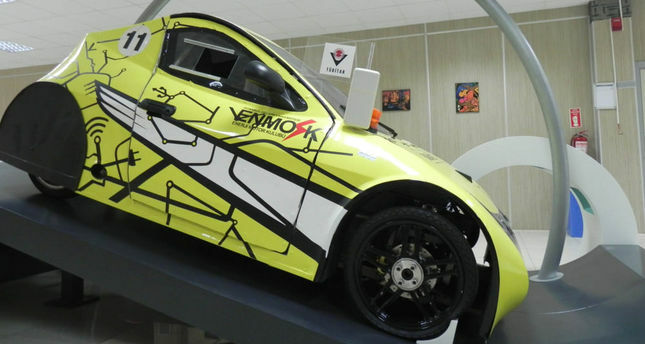 The car, originally named "Gelişim-1" was dubbed "Babayiğit" by Turkish media, after a large sticker on the hood of the prototype. "Babayiğit" or "brave" is how President Recep Tayyip Erdoğan described potential investors in Turkey's first domestic-made car. The project is supported by a state-run scientific body. Flying car will be an advanced version of the two-seater Gelişim-1. Speaking to Turkish media, Gelişim Üniversity Faculty of Engineering President Professor İlhami Çolak said they have already developed an electric car and its second version would be able to take off vertically like a helicopter. Çolak said the car was originally designed to overcome the overwhelming traffic problem in Istanbul. The concept of flying cars, as old as the history of science fiction, became wildly popular after the second film in the "Back to the Future" film franchise that envisioned a world with flying cars in 2015. The car has long been in development though nobody has realized the dream except a Slovakian company that developed the Aeromobil, a car "transforming in seconds from an automobile into an airplane" although it will be on sale in 2017 at the earliest. Unlike "Babayiğit," it is gas-powered.